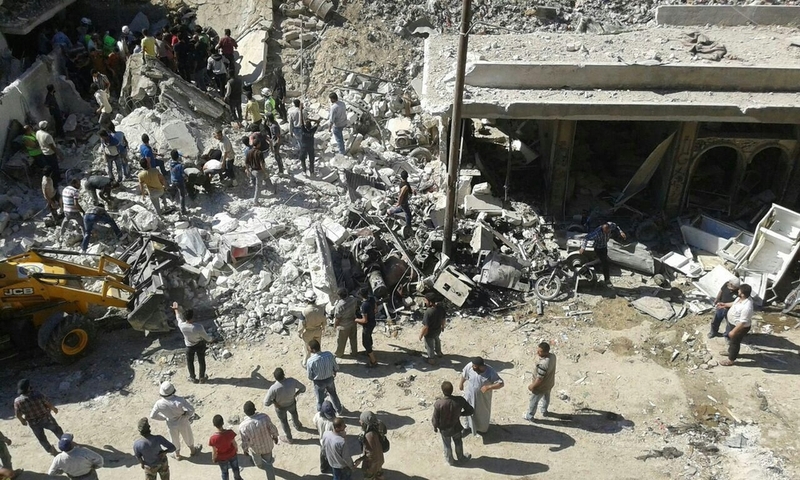 Yesterday afternoon, Thursday June 4, a strike by three missiles in a town in Idlib Governorate caused carnage and resulted in a mass casualty influx of 130 wounded patients to the nearest field hospital supported by Médecins Sans Frontières/Doctors Without Borders (MSF). This latest incident comes after a harsh month in northern Syria, including three chlorine gas attacks reported by an MSF-supported health post in Idlib Governorate in late May. As the violence continues unabated in Syria, MSF urges a massive scale-up of emergency assistance to the Syrian medics on the frontline of this crisis. “At 3:15 pm a fighter jet launched three rockets on a highly populated neighbourhood in the town centre,” says the director of the hospital, who requested to remain anonymous for security reasons. “Minutes later, our modest 12-bed makeshift hospital started to receive patients with horrific injuries. The hospital was quickly overwhelmed. Bodies were everywhere - on the tables, in the hallways, on the floor. “I can scarcely imagine the scale of the horror these doctors and nurses must have faced,” says Dr Bart Janssens, MSF Director of Operations. “We know from our experience that a 40-patient mass casualty influx in a well-equipped and fully-staffed hospital is a desperate challenge. The hospital director contacted MSF shortly after 3pm, when the wounded started to arrive, with an urgent request to send blood bags, stretchers and medicine. The patients kept coming until 7pm. Today emergency supplies will be dispatched to the hospital. A general medical resupply of this hospital will be organized in the coming days, as an event like this significantly depletes a hospital’s pharmacy stock. This is a medical facility that MSF has been assisting with technical advice and emergency support since 2013. This comes on top of a series of chlorine gas attacks in Idlib Governorate in late May, when another MSF-supported medical facility treated 136 patients for symptoms of chlorine poisoning. MSF responded by sending 700 kits for treatment of gas poisoning-associated respiratory conditions to this health centre and six other facilities in the affected area. In the dangerous environment of the Syrian war, MSF and other medical organisations can only run direct medical activities in a few areas where freedom of movement and action can be negotiated with armed groups. But elsewhere, with atrocities such as barrel bombs, missile strikes and chemical attacks an almost daily occurrence, an agile and flexible approach to medical support has to be scaled up. “Providing aid in Syria is still possible, but the environment is incredibly difficult,” says Dr Janssens. “Flexible and innovative approaches are needed. 6 MSF facilities are currently operating in the north of Syria. Meanwhile, MSF has spent four years developing a network of regular and ad-hoc emergency support to Syrian doctors through the rest of the country, in the areas that are inaccessible to MSF teams. The regular support aims to provide monthly supplies and technical medical advice to more that 50 makeshift medical facilities, with a particular focus on the besieged areas. Alongside this, more than 100 other facilities are in contact with MSF support teams, informing when there are acute emergencies and giving lists of essential supplies they urgently need.